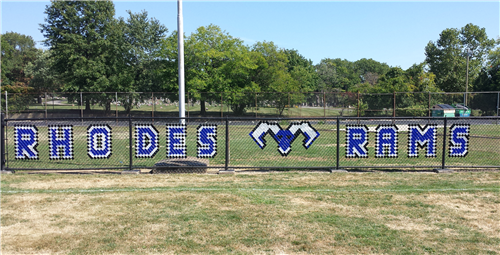 Be sure to check out the Rams News section at the bottom of this page for all of the latest happenings at James Ford Rhodes High School! Rhodes wins 2018 State Championship!!! 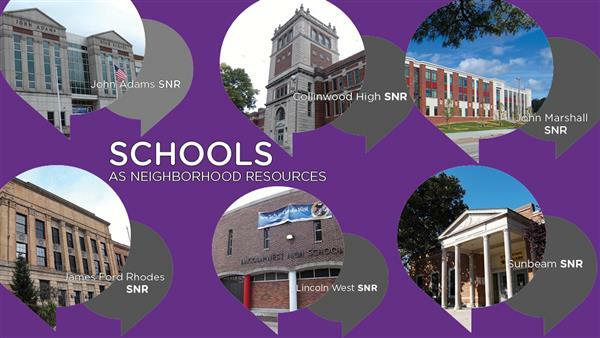 James Ford Rhodes High School is the only comprehensive CMSD high school on the west side of Cleveland that prepares 21st Century learners for the ever-changing world. Rhodes offers a wide range of innovative electives to help you explore your passions and introduce you to possible career paths. You can discover the world of fashion merchandising by taking a fashion, fabrics and fibers class taught by an art teacher and renowned designer, or expand your worldview by taking language classes in French, Spanish or American Sign Language. And that’s just the beginning. 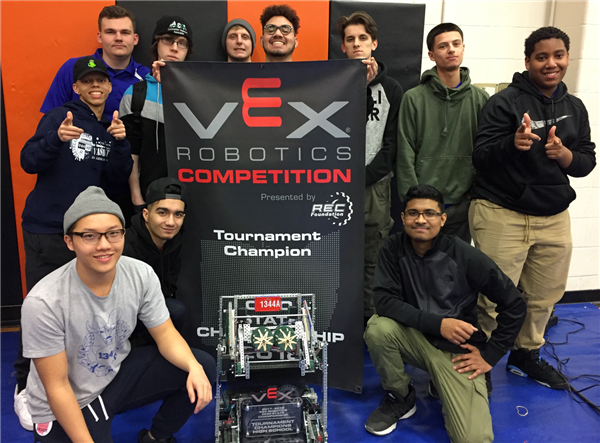 High Tech Academy through Cuyahoga Community College. College Now Greater Cleveland counselors. As a Rhodes student, you are encouraged to participate in a wide range of sports, clubs and extracurricular activities, including ROTC, Chess Club, Robotics, Anime Club, rowing, track, soccer, golf, bowling, football, girls or boys basketball, baseball, softball and wrestling. Our goal here at James Ford Rhodes High School is to prepare our students for an evolving global marketplace through rigorous academic instruction. Our student-centered approach allows for intellectual and personal growth in a diverse and challenging environment. Welcome to a new year at James Ford Rhodes. The district goal is to increase parent conferences by a rate of 7.5%. 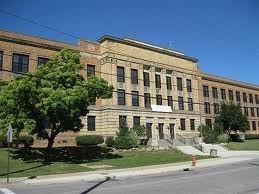 The district goal is to increase student attendance by a rate of 1.5%. The James Ford Rhodes Junior Ambassadors visited the Broadview Multi-Care in Parma for an early Easter celebration. The students delivered Easter Bears to the patients and engaged them in conversation. The patients are familiar witht the Junior Ambassadors who also visited the Nursing Home for Christmas and Valentines Day. The patients were very touched and happy to have the Junior Ambassadors visit them. Some of the patients do not get many visitors and welcomed the Junior Ambassadors. One of the patients actually was so emotional that she cried when she was presented with her Easter Bear. Another patient was thrilled to discuss his miiltary experience during the Korean War. 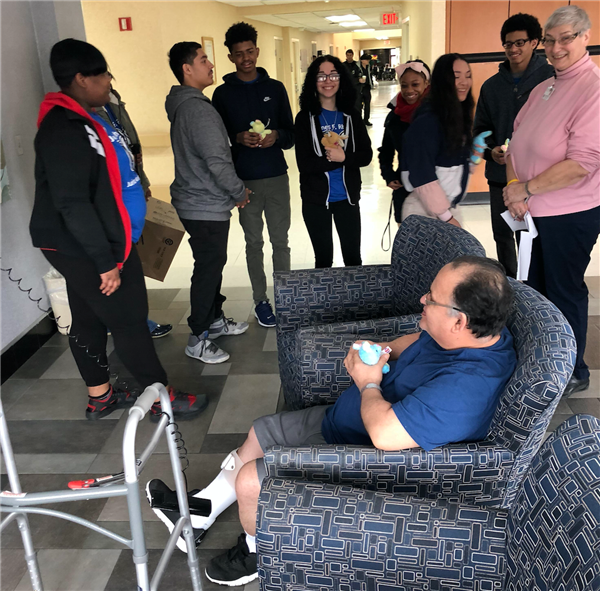 The Nursing Home Recreation Coordinator invited the Junior Ambassadors back for a social luncheon with the patients in their cafeteria in May. The Junior Ambassadors motto is Making The World A Better Place To Live! Six CMSD schools are open three nights a week for free recreation and other community programs. Historic: Six student-athletes from James Ford Rhodes sign National Letters of Intent to play college football. A heart felt congratulations goes out to the following senior football stars: Jayvon Benton will be attending Monroe College. Derrick Brown will be attending Hocking College. Derrin Brown will be attending Hocking College. James Langford will be attending Hiram College. Richard Monday will be attending Alleghany College. Cedric Taylor will be attending Hocking College. Last week, at the 39th conference, the club honored the District’s top seniors and connected them with civic leaders to discuss issues that are important to the seniors and articulate their visions of the future.